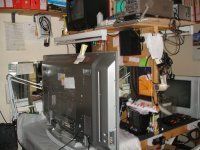 We offer a complete estimate and repair service for both Plasma And LCD TVs. Our trained engineers and fully equipped on site workshop are here to help you get your faulty product fixed as soon as possible. All major brands are serviced, including- Samsung, Panasonic, Toshiba, LG, Hitachi, Sanyo. Please contact us today to arrange a local call out. Telephone 01543 506834 or bring your product to us.